We met over 7 years ago at the cafeteria in Miami Dade College and it was instant chemistry. We started being very good friends and we would talk for hours!!! Since we both worked in the same building, we would take breaks during our work hours to chat a little bit and eat a snack together. We noticed we loved being with each other's company. 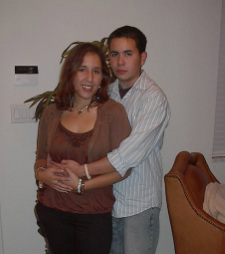 When we first started dating, although I was 19, I had to be home by 10pm!! Annoying right?? So we handled that for a year and then my curfew went to 12pm, which was a lot easier. We both worked and went to school so we liked spending our weekends together. Three years into our relationship, our responsibilities grew; school was taking more of our time because we were both completing our bachelor's degree, and we both were working full time jobs now, aside from other weekly responsibilities, so it was really hard to see each other. We usually had our date nights once a week on the weekends, but sometimes we were so tired, that we would stay home and not go out. This was the worst part of our relationship because although we talked constantly, we didn't see each other much but we made it through and grew stronger together. After I graduated, I found another full time job at FIU, the same building where David had started a new job a few months prior, so things became so much easier then. We started eating lunch together and would see each other much more often. Then we felt something inside of us started changing; we realized how much of a better person we are when we're together. We make each other so happy and we started needing each other more and more... so, we moved in together in November 2010. This was the best decision we ever made!!! We love living together and sharing all our experiences with each other. We both have learned so much from each other and we matured and grew closer together each year. I guess you know when it feels right and us being together has always felt that way. We get along amazing and know each other perfectly; but best of all, we live to make each other happy. He is my first boyfriend, my first kiss, my first man and I am his first as well and we feel so lucky that we found each other so early in life. We are so exciting to be planning our wedding and knowing deep inside that this is the confirmation of our devotion to each other. We would love for all of our family and close friends to be a part of our promise to each other that we will continue loving one another every day for the rest of our lives.